CREOLE MOON (D. Trimmer) Tetraploid (Wild Cherry Roundup x Kaskel Sdlg. “Best Edge”) 30” EM Re. Ev 5 ¾” These washed rose pink blooms with well defined circular red eyes combines much of the genetics I’ve been working with the past several years. The full formed thou subtle ruffled blooms are wonderful when set off next to pastels such as ACROSS THE GALAXY. 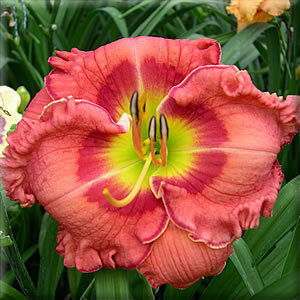 These full formed, round, very ruffled blooms are atop vigorous 18-20 budded plants.